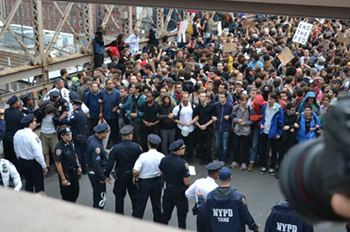 Mass Arrests on the Brooklyn Bridge: Is This What Civil Disobedience Looks Like? News is by now getting around that today there were mass arrests of Occupy Wall Street protesters—700 or more—on the Brooklyn Bridge. As over a thousand marchers made their way toward the bridge a few minutes after 3 p.m., they split into two groups. Some followed members of the Direct Action Committee who led the way up the elevated pedestrian walkway in the middle of the bridge. Another group, however, broke away and took to the Brooklyn-bound road on the bridge’s south side, eventually filling the whole roadway so that no traffic could get through. The front row of them locked arms and proceeded. At first, police had blocked neither entrance. Before the marchers on the roadway reached the first stone tower, and having been led by a phalanx of senior police officers, they were intercepted from the other side. (Even The New York Times offers evidence that the police may have purposely planned to lure marchers into a trap.) Out came dozens of dark-blue shirted officers with plastic cuffs—actually, cardboard boxes full of them. Some officers unrolled the same type of orange nets they had used the previous Saturday to make nearly 100 arrests, while others lined up opposite the protesters, halted them, and began to apprehend and cuff them, one by one. For a few minutes, the scene was very tense, as could be observed from above on the pedestrian walkway, where hundreds more marchers were passing by. On the roadway, there were scuffles as some force used against those being apprehended. “This Is a Peaceful Protest!” people chanted. And: “No! Sleep! Till Brooklyn!“ But soon the whole process assumed the appearance of routine, and, for those waiting to be taken away, of solemn dignity. At the front and back, with the crowd of marchers on the roadway surrounded on three sides by nets, police continued cuffing them and leading them away, one at a time. Slowly. Most of the marchers sat down and waited. “If you sit down, there is no fear,” called one marcher, each phrase echoed by the others in the “people’s microphone.” They talked, and smoked cigarettes, sang songs, and chanted. Many smiled as they were led away. Meanwhile, more police arrived on the pedestrian walkway, and they used more nets to cordon off the area directly in front of where the arrests were happening. And so it went on and on over the course of hours, as police vans and city buses arrived to take away those arrested. It started raining—lightly, at first, and then hard. The several hundred marchers who had been on the pedestrian walkway and had been turned back down to the Manhattan side rallied at the base of the bridge. They marched around some in the rain, including to 1 Police Plaza to demand the release of their comrades. Then they debated where to go next, and finally agreed to return to Liberty Plaza. On the way, they were joined by several hundred more, who had made it to Brooklyn on the pedestrian walkway and returned on the Manhattan Bridge. As a mass, together, they all returned with a sense of victory to the plaza. It was dark by then. Dinner was ready, and they celebrated and started planning the next move. This was the second major Saturday march halted by a mass arrest, largely on account of obstructing traffic. One might wonder, however, whether causing such an obstruction is really the proper mode of civil disobedience given the purposes of the protest. It’s helpful to recall a maxim of Gene Sharp’s: “Either you do something you’re not supposed to do, or you don’t something you are supposed to do.” To put it another way: do something good that’s against the law, or refuse to do something bad that the law demands of you. Creating such an obstruction certainly does fulfill the purpose of occupation—it is a way of reclaiming public space, of being heard, and of stopping business as usual. But it also obstructs a lot of people who are not the protest’s targets. Therefore, this may not be the most appropriate law to be arrested for breaking—or at least not the one that sends the clearest message. What might be better? Perhaps something along the lines of Tim DeChristopher’s well-known obstruction of an illegal oil and gas lease auction, for instance. In this and other classic cases of civil disobedience, from Gandhi’s salt march, to the sit-ins at segregated lunch counters, to the Freedom Rides, to Rosa Parks’ choice of seat on a Montgomery bus, resisters took care to break the precise laws or rules or customs that they opposed. Their message, even without having to say anything, was absolutely evident. Especially since many people complain that there isn’t enough clarity of message from Occupy Wall Street, more clarity of action might go a long way to winning even more people to the rapidly-growing cause. Today, hundreds of people were arrested, many surely for the first time. More seem likely to follow. The world was watching (including tens of thousands on the movement’s livestream TV channel), and what it saw were entirely peaceful protesters, in the streets to oppose an unjust economy and a corrupt political order, being arrested en masse while bringing their messages across one of New York’s greatest landmarks.